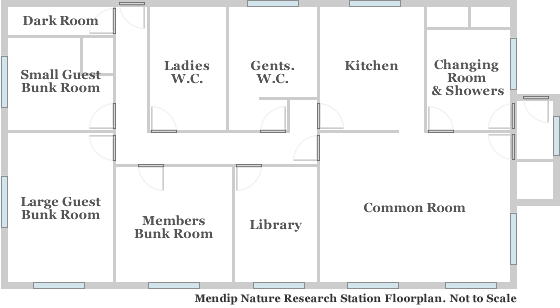 The Mendip Nature Research Station at Wells Hill Bottom is a spacious purpose built centre situated on the B3135 Cheddar road, high on the Mendip Hills. It is within easy reach of the major Mendip caves, Wells city centre and is within walking distance of The Ploughboy Inn for food and liquid refreshment. The Hut (as our Station is often fondly known) enjoys the benefits of a comfortably furnished common room, which boasts soft arm chairs and sofas and a central open fire- just the place for thawing after a taxing day in the often unpredictable Mendip weather! We also enjoy the advantage of being purpose built, affording us facilities ideally suited for outdoor pursuits including a drying cupboard, hot showers and a ‘dirty’ changing area (perfect for shedding dirty/wet kit and outdoor gear). Regrettably the Station does not have disabled access. Members may use the station at any time, but guests and associate members must book in advance. Fully equipped kitchen with 2 gas cookers/hobs, 2 microwaves, 2 fridges, toaster, pots/pans, crockery and utensils. Three separate bunkrooms; Large Guest Bunk Room (3 double bunks and 9 single bunks), Small Guest Bunk Room (6 single bunks), and Members Only Bunk Room (3 double bunks and 9 single bunks). All bunkrooms are equipped with three tier bunks. Large changing room with showers (20p operated) and drying cupboard. Common Room seating area with sofas, comfy chairs, tables for dining, and a large central fireplace (wood provided). Full central heating and smoke alarm protection. Large garden area with barbecue.